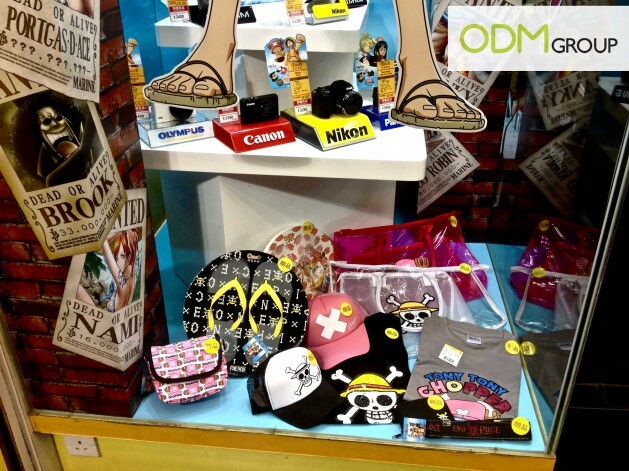 If you have walked around the Wanchai Computer Center in Hong Kong recently, you might have spotted these One Piece gifts with purchase in a camera shop. As you can see, there is a very interesting POS as well (with this fake brick wall with “Dead Or Alive” rewards on it). It’s an excellent way to promote the manga and the brand together, at the same time. With every single purchase you make in this camera shop, you can receive promotional gifts with the One Piece skull logo on it . Co-branded offers are very often efficient in terms of ROI.